As I started to write this post, I realized I needed to start adding a year to my titles. I’ve now been actively donating to at least one nonprofit each month for over a year. While my husband and I haven’t reviewed our 2012 donations yet for tax purposes, we still feel like we didn’t quite give enough. Hard to believe, right? But when you get into the habit of giving regularly, and you realize that the money that went toward those donations wasn’t missed, you start to think about how you can increase the donations. I think about what the book Giving with Confidence taught me and the simple formula for being a philanthropist, and I realize that I can make an even bigger impact. At the same time, I still feel like we’re in the very infancy of the research stage, feeling out where we feel most confident about putting our money. The great part is that this public Giving Pledge has given my husband and I the opportunity to talk and think more about where we’re giving and why. This month, my husband chose our donation recipient. 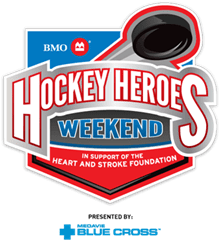 We’re sponsoring Eric MacDonald as he participates in the BMO Hockey Heroes Weekend in support of the Heart and Stroke Foundation of New Brunswick. Eric is a colleague of my husband’s. His dad was only 28 years old when he died of a heart attack. How many of us even remember our father when he was 28 years old? The foundation is “committed to increasing physical activity rates across the province to reduce the risk of heart disease and stroke.” I lost an uncle at the age of 50 to a heart attack. I remember being in total shock when I heard the news. Fifty seemed way too young to lose him. So, we support Eric and his team. I actually wish we could make it to the event. It sounds like a lot of fun. And I’m not just saying that because Ray Bourque is going to be there. Did you donate this month? How wonderful to be in a position to give and then realize you can give more. I think that’s the new American Dream. I was just dropping by since you were so kind as to comment on my blog on Monday when I was the SITS featured blogger. Also, I’m hosting a giveaway on my blog this Friday if you’d like to come back by and check it out that would be excellent! I think the key is to start small. I don’t consider what we give to be big amounts, but we’re hoping to increase as we are more able to. 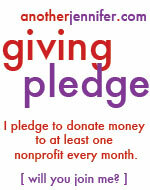 This pledge has helped me realize that I can give more than I thought. Thanks for stopping by. I will check out your giveaway! What a great opportunity you have to give and receive joy for doing so. I have my special charities that I donate to, mostly for animals as they have no one to speak for them. That’s a great reason to donate. We adopted our oldest dog from an animal shelter and enjoy donating to them as well.